Movie Review: “The Stanford Prison Experiment” is a fact-based thriller directed by Kyle Patrick Alvarez (“C.O.G.”) and written by Tim Talbott, starring Bill Crudup as the obstinate Dr. Philip Zimbardo, a Stanford University psychology professor who conducted a singular experiment in 1971. He carefully selected 24 male students, which half of them will be incarcerated for 15 days as real prisoners while the other half will act and dress (uniform and glasses accordingly) as prison guards. The objective is simple: to test the influence of the personality in the conflicts between guards and prisoners. The students seem highly motivated for earning some extra bucks for the summer ($15 dollars/day) while participating in a study case that should be seamless and pacific. However, what started being something almost illogically funny or even stupid, ends up slipping into crazy behaviors, where the guards really abuse of their power, taking a sadistic pleasure in humiliating the inmates. The reactions vary according to each personality: some try to rebel and then escape, some adopt a subdued posture, some others are more vulnerable to the pressure and start freaking out, one demands his glasses, another refuses to eat as a protest… Even more curious was to observe their silence during their parents’ visit, and the arrival of an ex-con to join the staff. The performances are on-the-nose, and psychologically speaking, the film gives us a lot to reflect upon. 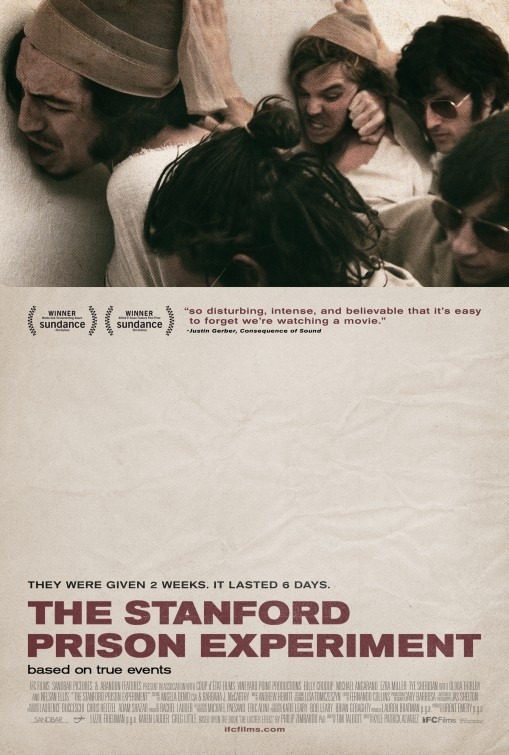 The Stanford Prison Experiment was terminated after six days, and the film cleverly ends by reenacting posterior interviews with the involved. Mr. Alvarez managed to set the perfect edginess and counted with Christopher McQuarrie (director of “Jack Reacher” and co-writer of “Edge of Tomorrow”) in the production.